In the two-parter pilot episode, Darkwing Duck ends up rescuing and adopting a young girl named Gosalyn Waddlemeyer. The original "super spy" pitch for the series just wasn't clicking with anyone, because it was just a bunch of characters - there was no bond between them, other than happening to be in the same story. So wanting to create a sense of family, the writers began wondering "what if Batman had to raise a little girl?" So if there was no Gosalyn, there'd be no Darkwing Duck. Writer Tad Stones based Gosalyn on his daughter Brenna, who was only 2 at the time: yes, Gosalyn was seven years older than that, but her incorrigible, energetic personality was what Stones thought his daughter would be as she grew up. Like Kit from TaleSpin, Gosalyn wasn't an annoyance; she's bright but a bit loopy, and her bravery verges on the foolhardy, but she's not a Scrappy. All she wants is to be a superhero like her new dad. Gosalyn is posed like she's trying to act innocent: head down, eyes up, toes turned in, and her fingers interlaced behind her back. Her red hair (yes, she's a duck who has hair in addition to feathers) is pulled up into two... wait, would the term "pigtails" be offensive in a world populated by anthropomorphic animals? Because Gosalyn is a raucous tomboy, she's wearing a sports jersey and sneakers, though the pastel purples make her look more feminine than her dad. 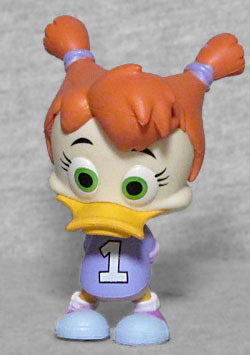 And speaking of colors, I always found it interesting that Gosalyn's body is a darker shade than the white used for the other ducks - is that the Disneyverse equivalent of being a different ethnicity?